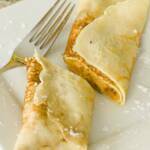 These pumpkin pie crepes were a huge hit with my friends. The ladies wanted hot crepes with hot pumpkin pie filling while the gentlemen wanted hot crepes and cold pumpkin pie filling. In a large mixing bowl, mix all ingredients except butter until there are no lumps. Heat a skillet on medium (the size of your skillet will be the size of your crepe, so just decide how big you want them). When the skillet is warm, melt enough butter in it to coat the skillet. Pour a ladle full of batter onto the buttered skillet and swirl the pan to spread the batter evenly over the entire skillet. Cook untouched until bubbles form in the crepe (about 1 minute). Flip the crepe and cook for another minute. Repeat steps 3-7 until all of your batter is used. To speed things up, you can work two skillets at once. It's not as hard as it sounds. The filling for these crepes is pumpkin pie! I used the same recipe and steps I used when I made pumpkin pie frosting. Check out my pumpkin pie frosting post for the details.